SE16 is faced with an extraordinary number of development sites at present. Each one has it’s own group of interested parties but the overview is sometimes hard to maintain. Here we have brought together a selection of the major developments in SE16 to help you keep up-to-date with them. We have also listed at the end other significant developments in the area that you should find out more about from the Southwark Planning site if you are interested in them. United St Saviour’s Charity is a significant influence on SE16 as a local funder with intimate knowledge of the local scene. They have embarked on an ambitious project to build 57 new “extra care dwellings” for elderly people who wish to remain living independently in Bermondsey. The plan requires the demolition of the existing buildings on Southwark Park Road between Longley Street and Reverdy Road and the construction of a part 2-storey and part 5-storey building along the full length. 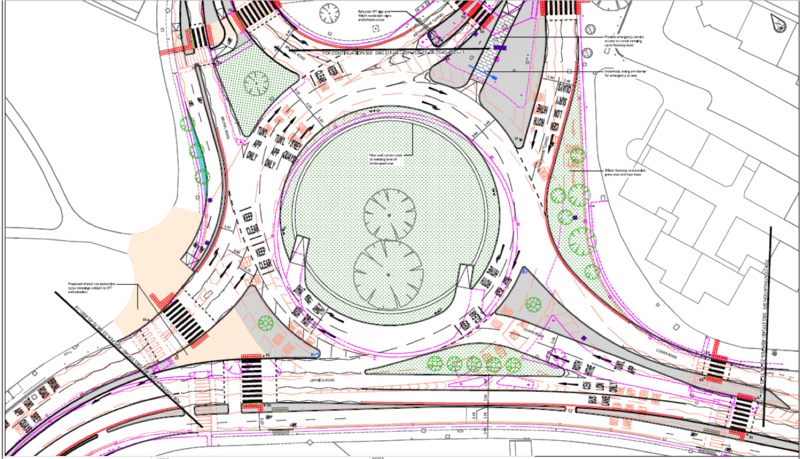 Everyone who lives anywhere near Jamaica Road or Lower Road is very well aware of the shortcomings of the roundabout at their junction. For some years now Transport for London have been promising to rebuild it to meet the current traffic conditions. 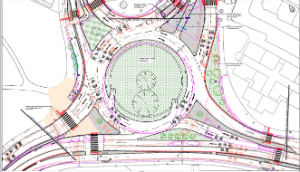 Finally at a recent meeting of the Canada Water Consultative Forum (CWCF), Cally Davidson Scheme Sponsor for TfL’s Road Space Management could make a presentation of their current thinking. She was keen to emphasise that the ideas are still developing and that TfL plan to consult on them in February 2016. However, they give a useful indication of what we might expect. The one-way system that dominates Lower Road, Rotherhithe Old Road and Bush Road has also been due a significant rethink for some years. In a similar timescale to TfL above, Simon Phillips of Southwark’s Transport Policy came to the same CWCF meeting to show their current thinking. 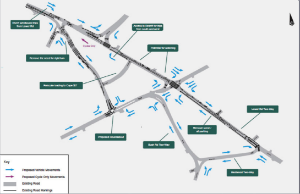 The essential difference is that the proposals – again up for consultation in February 2016 – would make all three roads two way whilst diverting all through traffic in both directions along Bush Road and Rotherhithe Old Road, leaving Lower Road in this section for local traffic only. 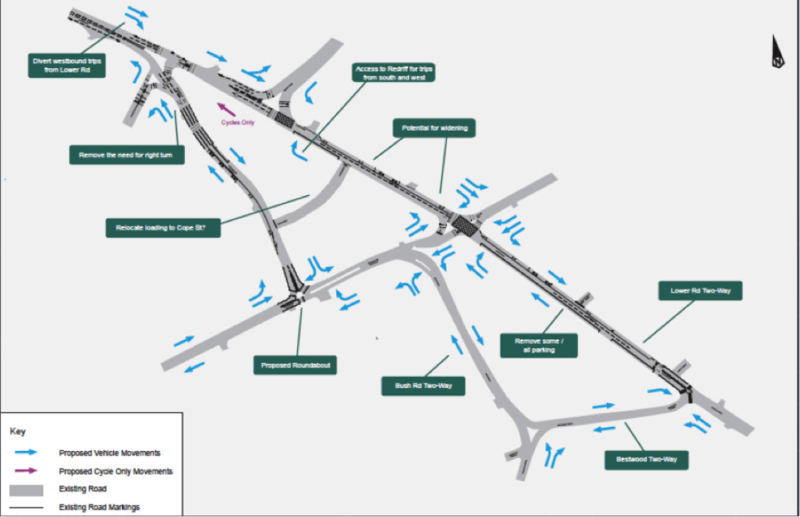 The routes (and roundabout) have to be redesigned to the timetable for the Mayor’s Cycle Superhighway 4 (CS4) Phase 1 of which this is a part due to be completed by April 2017. The crisis of housing in London makes every square foot of the borough a potential place for new council homes to be built. Riverside locations are particularly attractive as the sale of a proportion of the properties can bring in a substantially increased amount allowing more council homes to be built elsewhere. 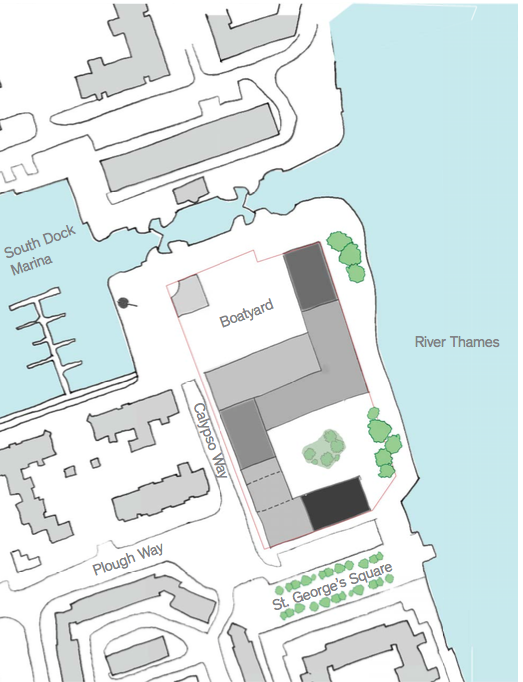 South Dock Marina is one such site and the LB Southwark has begun consulting on a scheme that would see 213 new homes built at up to 20 storeys alongside a new boatyard, space for a public park and more café and commercial units. Local opinion has been strongly expressed at two sold out consultation events in mid-October. Several workshops are promised before a further round of public consultation in February 2016 and the building is expected to start onsite in late 2016/early 2017. More details of this development are available here. 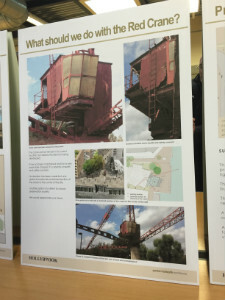 When the Red Crane was threatened by a planning application from Southwark and Hollybrook Homes, there was a strong response from heritage groups and local residents on both sides of the river. More properly a Scotch Derrick, the monument to the timber industry that fed the Surrey Commercial Docks for centuries was regarded by some as a pigeon loft and by others as a key part of the area’s industrial memory. 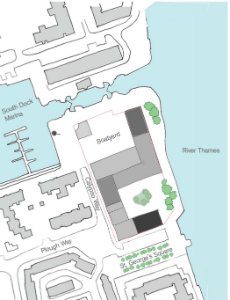 Now Hollybrook have come forward with outline plans for the site that will extend the Thames Path along the riverside and provide a café on the riverside. The precise number of homes to be built is still being decided but following an exhibition last Wednesday by Hollybrook Homes, the team there will be working up the detail toward further consultation and a planning application next year. The future of the crane remains uncertain due to the level of corrosion and neglect it has lived with for decades. Several suggestions are made for preserving some parts of the structure on the site.